At this year's D.I.C.E. Awards, the big winner was Journey, which took home eight awards out of 11 total nominations, including Game of the Year. Wrapping up the 2013 D.I.C.E. Summit was the 16th Annual D.I.C.E. 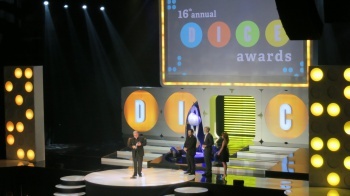 Awards hosted by Chris Hardwick. This year Journey led the pack with a whopping 11 nominations, and managed to take home eight awards, including Outstanding Achievement in Sound Design, Outstanding Innovation in Gaming, and Game of the Year. Telltale's The Walking Dead did pretty well for itself at the show as well, netting four awards including Outstanding Achievement in Story, Outstanding Achievement in Character Performance, and Adventure Game of the Year. Much to my delight, XCOM: Enemy Unknown took home a pair of awards, namely Strategy/Simulation Game of the Year and Outstanding Achievement in Gameplay Engineering, while Borderlands 2 brought home Action Game of the Year. Check out the full list of winners below.